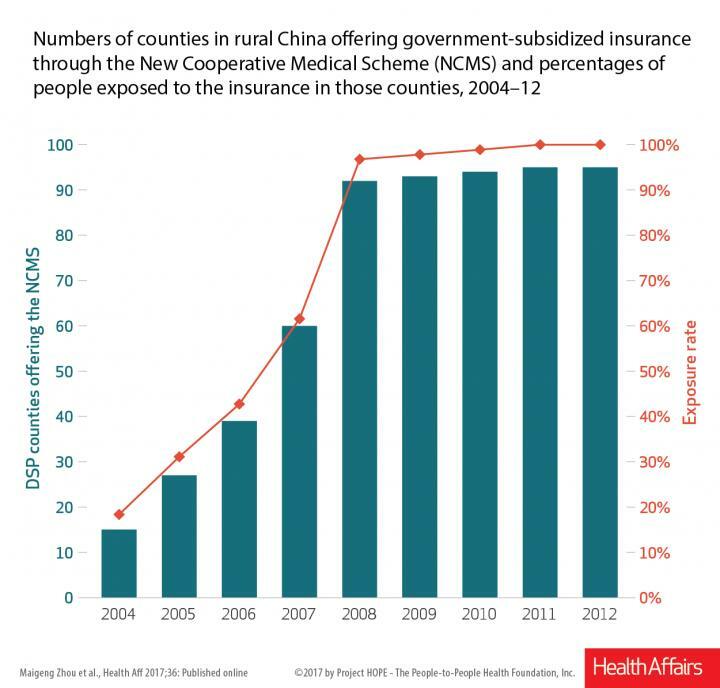 The September issue of Health Affairs includes a study by Maigeng Zhou of the Chinese Center for Disease Control and Prevention and coauthors that examined whether wider availability of health insurance through the New Cooperative Medical Scheme (NCMS) reduced adult mortality in rural China. The authors assembled and analyzed data for the period 2004-12 in seventy-two counties, using newly collected data on NCMS implementation. According to the authors, the percentage of the population living in counties that offered the NCMS increased from 18.4 percent in 2004 to 100 percent by 2012 (see the exhibit below). However, the introduction of the NCMS was not shown to be significantly correlated with reductions in county mortality rates among people ages sixty and older. The authors note that these results should be cautiously interpreted, and that some mortality reductions might become apparent only after additional time has elapsed. They conclude that population health policies remain central to China's efforts to increase healthy life expectancy and reduce the disparities between its rural and urban residents. Health Affairs is the leading peer-reviewed journal at the intersection of health, health care, and policy. Published monthly by Project HOPE, the journal is available in print, online, and on mobile and iPad app. Additional and late-breaking content is found at http://www.healthaffairs.org. To update your subscription preferences, please visit the Alerts page on our website.